keyboard_arrow_rightIs Solar Energy Right for You? It used to be that people never had to think about their electricity beyond how much they were using and what their bill would be at the end of the month. When you wanted to move into a new apartment or home, you just called the local energy company to make sure the lights would turn on when you moved in. While that system is easy to use and still around today, people have begun using solar energy, which is changing the energy game, for our planet and for our wallets. New technology is creating energy that’s greener and even cheaper for people to use in an effort to reduce the impact of human society on the well being of the earth. This has result in things like water and wind energy, but solar power is the biggest green energy source for homes across the globe. In most places, solar power isn’t what you’re going to get right when you move in, so it’s an added investment and most homeowners need to decide if it’s right for them. Getting your home equipped to run on solar power is cheaper than ever before, but it’s still a major project to undertake. And if you don’t know much about it, it can be difficult to decide if it’s right for you and your home. Read on to figure out if you should jump on the solar energy bandwagon and how it would change your carbon footprint for the better. The term “solar power” is pretty straightforward. It’s simply the process of converting sunlight into electricity. Studies have found that the sun provides more energy to the earthzfbzcuyqsybrvyararsyawfcfawwursr in one hour than what every nation produces in a year. That’s a large amount of pre-existing energy to draw from that would reduce human efforts to create other forms of energy. Solar panels make this easy by capturing wavelengths of solar radiation and converting them into electricity. It might be difficult to picture solar power charging your home when you’re so used to seeing electrical lines running down every street. The truth is that by connecting your home to solar panels, you’d seamlessly transition anything that runs on gas, oil or electricity over solar energy. Because the sun’s radiation is so powerful, you wouldn’t be compromising how well or how often the machines in your home would work. Something else people often wonder about when they consider switching to solar power is what would happen if you had a rainy season that blocked direct sunlight. Many areas face large amounts of rainfall every year, so cloud coverage is typical. Along with solar panels, there are backup batteries that can be installed that are kept continuously charged. While panels can absorb energy that’s not direct sunlight, the battery would keep your home running in periods of thick cloud coverage or darkness. Like with other major purchases, there are payment plan options for those who couldn’t pay for their panels upfront. This means that you wouldn’t have to spend months or years waiting for solar energy while you saved up. And because solar energy will save you money, paying off the panels each month will get easier because you won’t be paying for an expensive electric bill. Wondering what you would save if you switched? Everyone’s solar bill is going to be a little bit different since it does depend on where your house is located. You can use a solar energy calculator to figure out your specific bill and see how much you’ll save. On average, Americans spend over $1,500 on electricity each year, which can be majorly cut down by solar panels. A concern homeowners typically have before doing a massive project like a renovation or installation is what the impact on their home value will be once the project is completed. If you’re worried about solar panels being a fad and not being valued in the coming decades, you don’t have to worry anymore. Homes with solar panels have been increased in sale price by $15,000. More people are installing solar panels every day, so it be a home feature that’s more sought out as time goes on. The first way you can maximize your solar energy is by living or moving to a place that has an abundance of direct sunlight. Investing in a battery will also make a difference for those in locations with less sun than others. Beyond that, there are things you can do to make the most of your solar power that you might not have considered before. Even when you’re using natural energy, there are ways to cut down on your energy consumption to truly save money. Things you might be doing now would be skipping the dryer and hanging wet clothes instead or using blackout curtains to keep the inside of your home from heating up. With solar energy, you can also install metal roofing to increase solar rays and save more energy than you use. Every little effort makes a difference, and what you do to save on electricity can be done for solar energy too. When you don’t know much about solar energy, the thought of installing panels and completely switching over from regular electricity is intimidating. People worry the technology not sticking around or not being as reliable as what they use now. But leading solar power companies like Vivint Solar make it easy for you to make the switch. People who have switched to solar energy have found that they save more money in the long run and don’t have to compromise on what they want use in their daily life. 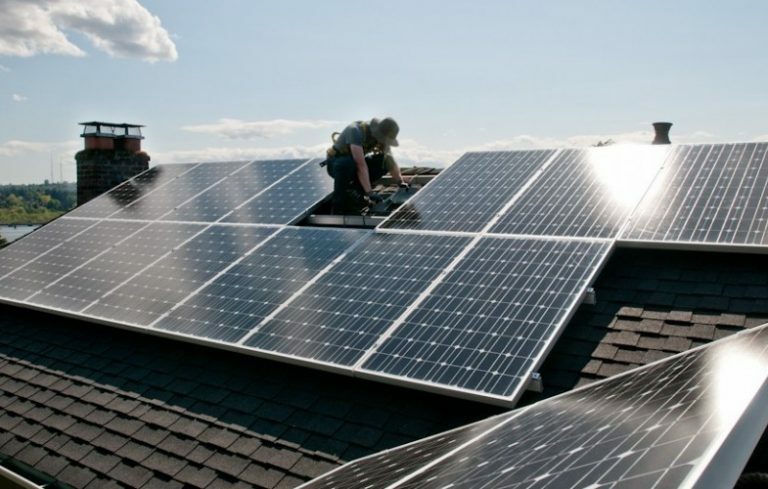 Think carefully before installing any panels because everyone’s situation is different, but investing in solar energy is usually beneficial to most homeowners. Kacey Bradley is the lifestyle and travel blogger for The Drifter Collective, an eclectic lifestyle blog that expresses various forms of style through the influence of culture and the world around us. Kacey graduated with a degree in Communications while working for a lifestyle magazine. She has been able to fully embrace herself with the knowledge of nature, the power of exploring other locations and cultures, all while portraying her love for the world around her through her visually pleasing, culturally embracing and inspiring posts. Along with writing for her blog, she frequently writes for sites like US Travel News, Thought Catalog, Style Me Pretty, Tripping.com and more! Follow Kacey on Twitter @kacey_mya and subscribe to her blog (driftercollective.com) to keep up with her travels and inspiring posts!